Lots going on tonight. First, a couple of shots of the so called “Super Moon”, not that you can really tell much difference unless you have photos of other Moons to compare. Next up, sunset tonight. 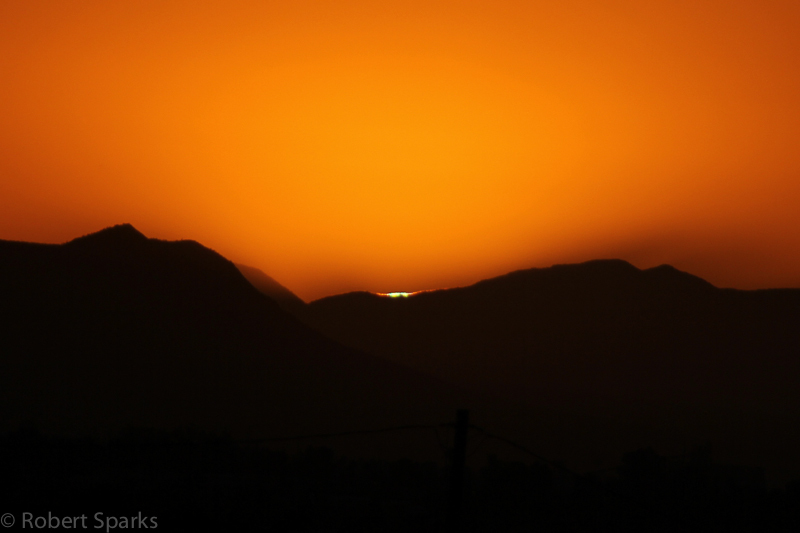 Click through to see the little green flashes evolve as the Sun sets. Finally, the ISS pass tonight from Tucson. 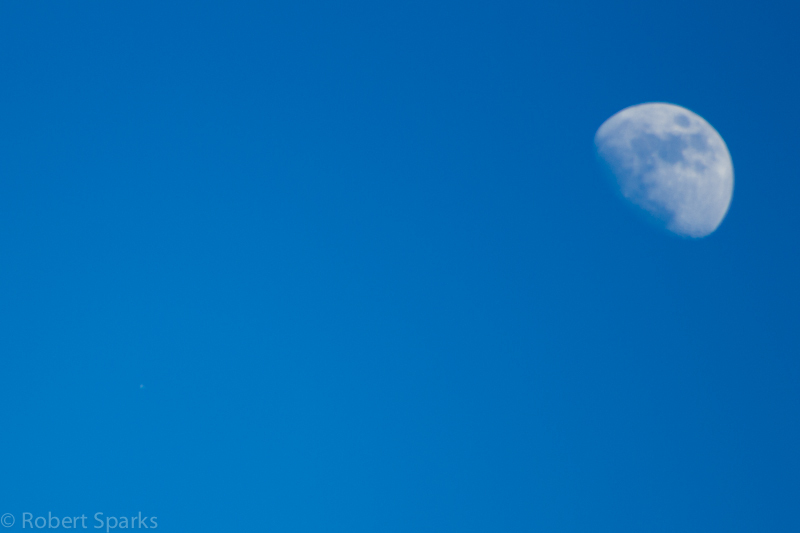 With the recent Moon/Mercury/Venus conjunction, some people might wonder where my photos are. Well, I am in Fairbanks, Alaska and that conjunction was pretty much invisible from here as they all set about the same time as the Sun that night! 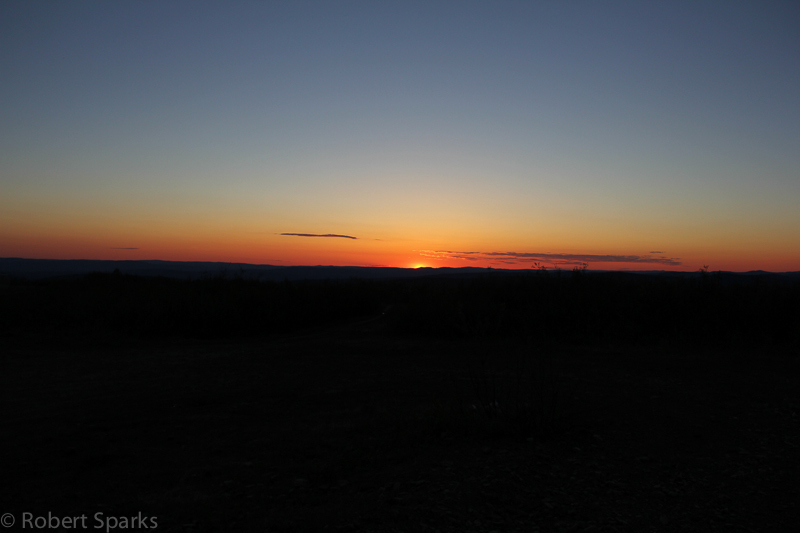 Besides, sunset now is very late at night and the sky never gets dark before the Sun starts coming up again…Fairbanks is not north of the Arctic Circle so there is never a 24 hour day here, but it still never gets dark. I wanted to see a sunset while I was up here and wanted to wait until a clear night. I was told by the locals that Murphy Dome was the place to go (about a 30 minute drive from the University of Alaska-Fairbanks campus where I am staying). I needed to get somewhere that had a decent horizon to see the Sun and that seemed to be the closest place. I got a late start and left about midnight. 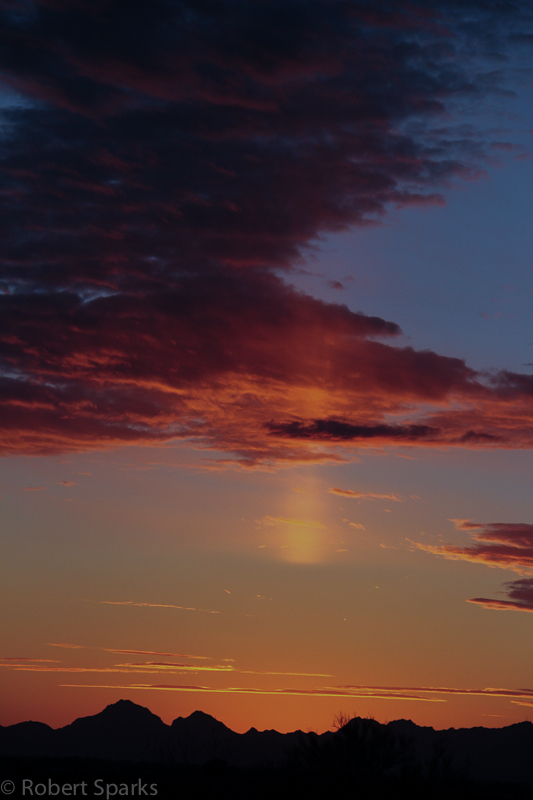 According to the charts, sunset in Fairbanks was at 12:38am so I thought I was cutting it closer than I like. Of course sunset times assume a flat horizon and you are not standing on a hill…so sunset actually didn’t happen until about 1:10am. Amazing what a difference terrain can make! First, here is Murphy Dome. Yes, there is a dome. Mosquitos are plentiful this time of year and they bite. Fortunately, clothes are a sufficient deterrent to them here (unlike Everglades mosquitos which bit through denim!) and I only got some bites on my face as the rest of me was covered up pretty well. Here is a wide shot of where I was. I zoomed in as the Sun got closer to the cloud tops. 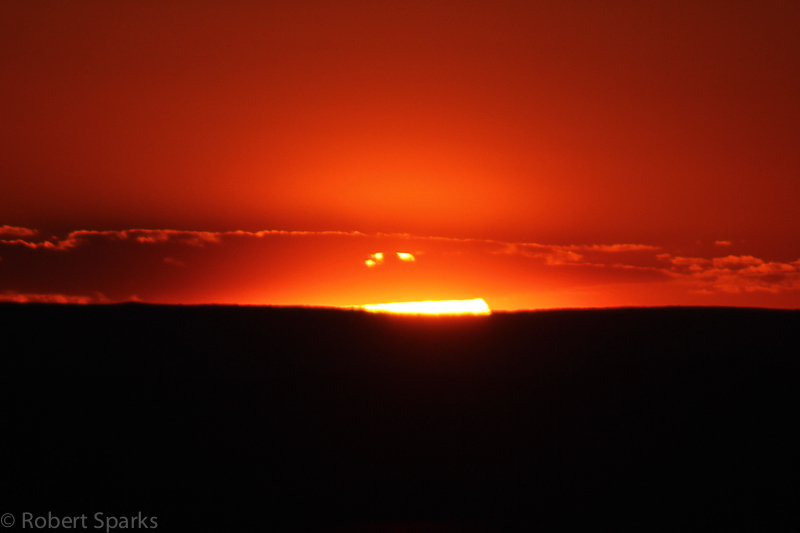 There was some distortion at the top limb, but couldn’t quite pull off a full green flash up there. 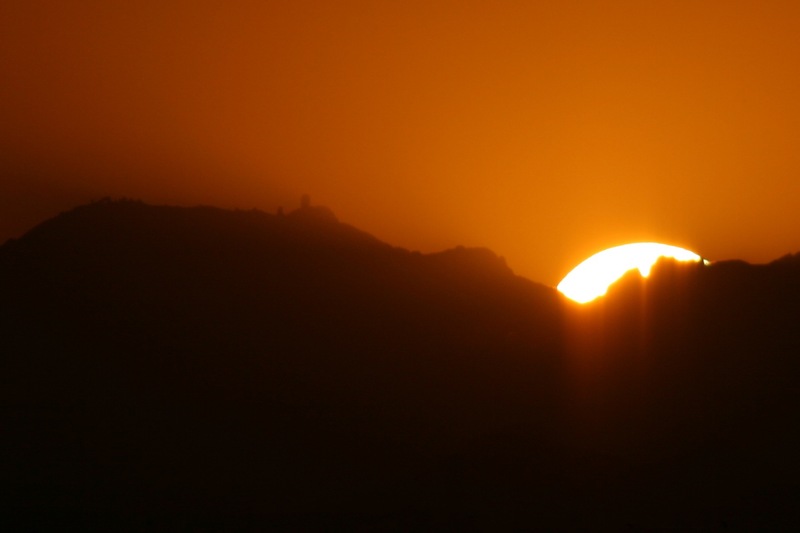 You can see some nice distortion of the Sun near the horizon. 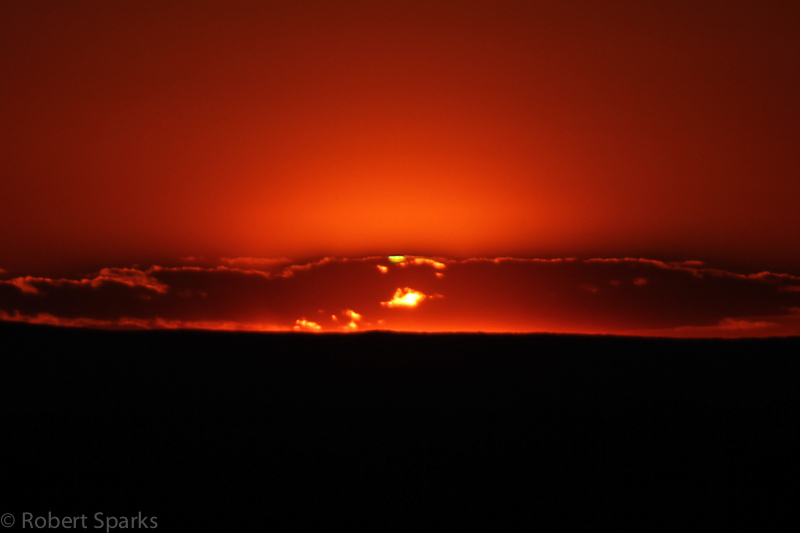 Although I didn’t get a full mock mirage green flash, the clouds provided a nice backdrop to see a cloud-top green flash. This was visible naked eye as well as photographically. Every now and then I get a new one that I haven’t seen before that makes me think. You might notice there are some small gaps in the clouds. Well, I know you can get a cloud-top green flash, but it seems you can also get them through little holes in the clouds as well. I don’t think this is due to scattering since scattering should take out the greens before the reds. I am very happy I got to see a sunset from here. It is very different. The Sun skims the horizon as it sets and is very prolonged compared to the more southerly latitudes I am used to. Unfortunately, with my schedule up here, I don’t think I will be able to get out for another really late night to do it again as I am dragging pretty bad today! 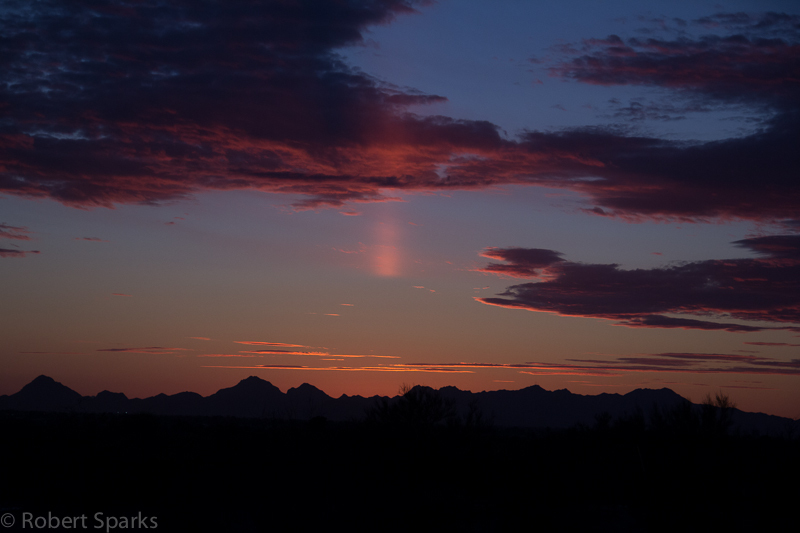 Tonight after sunset we were treated to a Sun Pillar in Tucson. 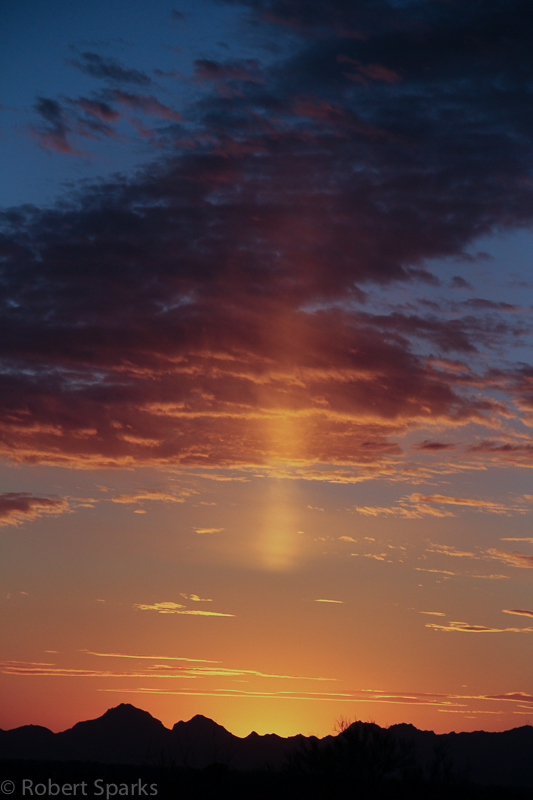 Sun pillars are caused by light reflecting off of ice crystals high in the atmosphere. 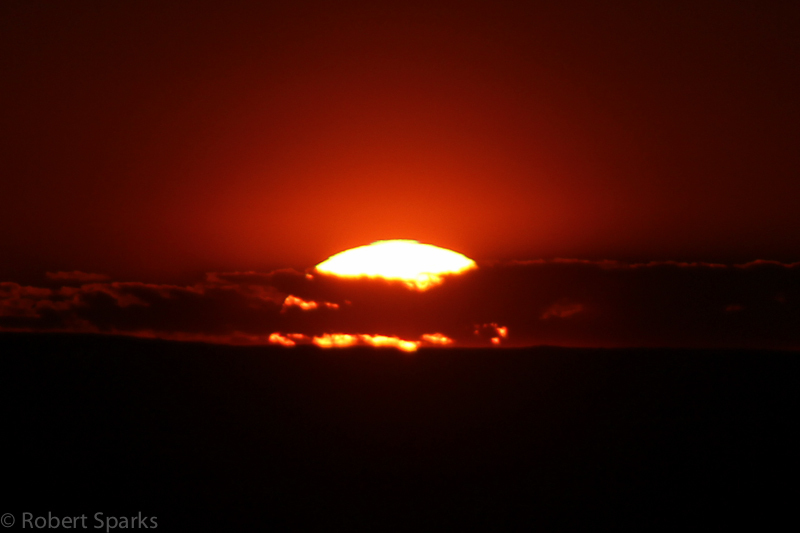 I was out photographing sunset (weak green flash tonight) and was starting to put my camera away. I turned around to look west again and that’s when I saw the pillar. Glad I wasn’t in too big of a hurry to get out of there! Today I am in Chile at Cerro Tololo Inter-American Observatory. I have been having a great time touring and doing night photography and observing (my camera is outside snapping shots for a timelapse I hope to put together tomorrow). I am sure I will post lots of pics and several blogs, but wanted to get tonight’s sunset posted. The Pacific Ocean is to the west and you get great temperature gradients when you look down from the top of the mountain over the cold Pacific Ocean. Lots of great effects tonight. Here are three of my favorite pics. First look closely at the top limb of the Sun for a hint of a purple flash. I have never recorded purple so early in a sunset. 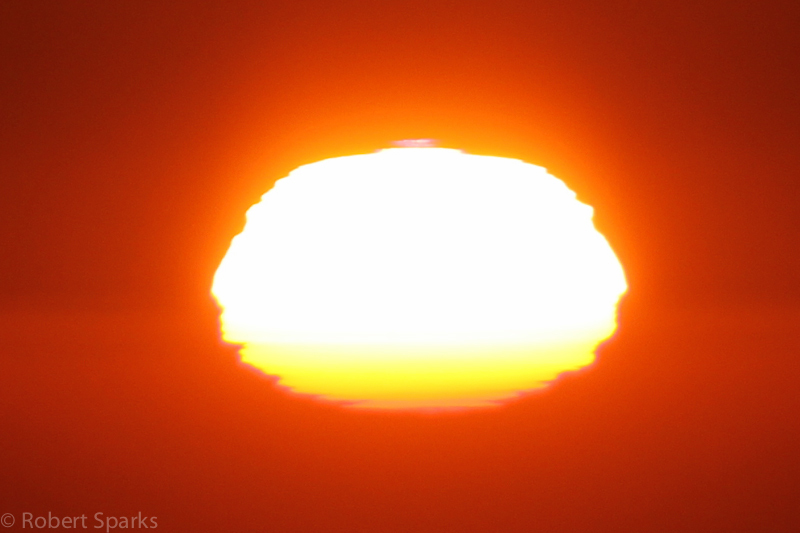 Next, you can see a nice strong green flash at the top of the Sun. Finally, there was this completely crazy thing that happened with multiple simultaneous green flashes, very strong ones. Don’t even ask me how that happened! Finally, the same atmospheric processes that create these sunsets are also present at Moonset. Tonight the Moon became very distorted as it set. I really wasn’t quite prepared for that and missed a great pic. 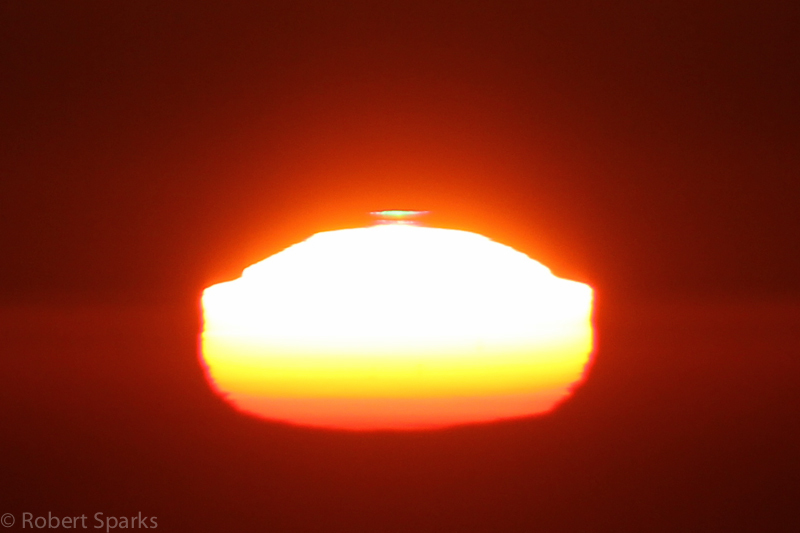 I was watching the Moonset on liveview on my camera and saw a green flash FROM THE SETTING MOON! Unfortunately, I was not quick enough to capture it. I will have another chance from CTIO tomorrow night and will be ready! It is late and getting cold and I am getting tired, so other posts will have to wait until tomorrow! Although closest approach between Mercury and Mars was Friday night, the show is still going on and the Moon is joining the party. 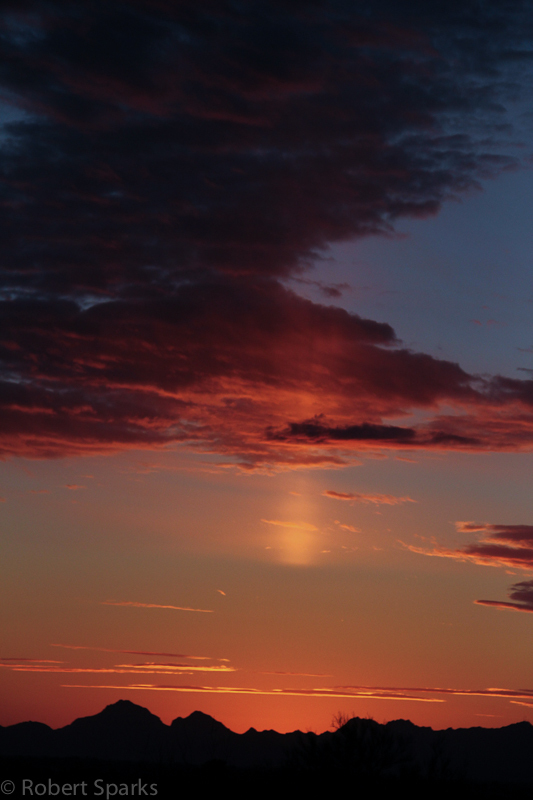 But before I get to that, sunset was particularly nice tonight. There were several nice flashes starting with green and even including blue and purple. Interestingly enough, last year on almost exactly this same date, I got wonderful pics of multicolored flashes as well. Wondering if there is something about this mountain that makes it particularly conducive to producing this phenomena. Click to see larger versions and look close for the colors. 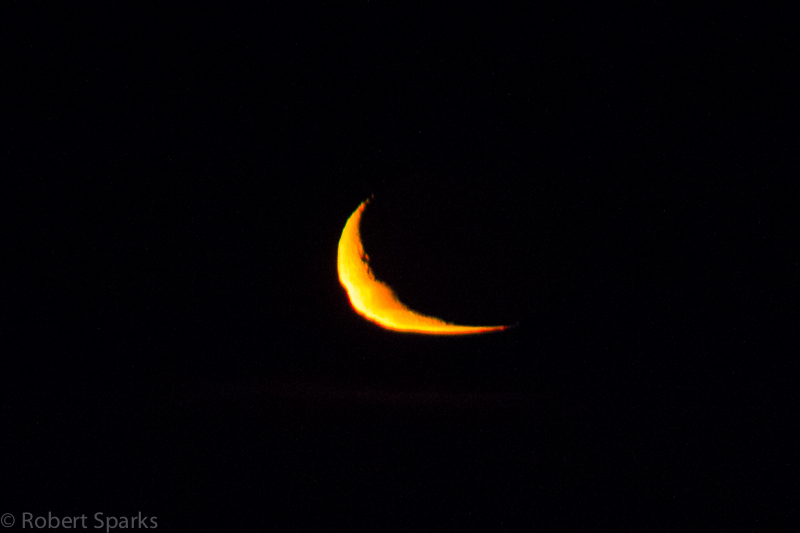 After sunset, I was actually more interested in seeing the crescent Moon tonight. I knew it could be a challenge since new Moon occurred earlier today (12:22am MST) so the Moon would be less than 19 hours pas new. I finally spotted the Moon at about 6:43pm putting the Moon 18 hours and 21 minutes past new. At this time less than 1% of the Moon was illuminated.I probably could have found it a few minutes earlier, but I was looking a little too far south for it…I found it a little farther north than I was expecting (that will teach me to look up its azimuth before I go observing!) 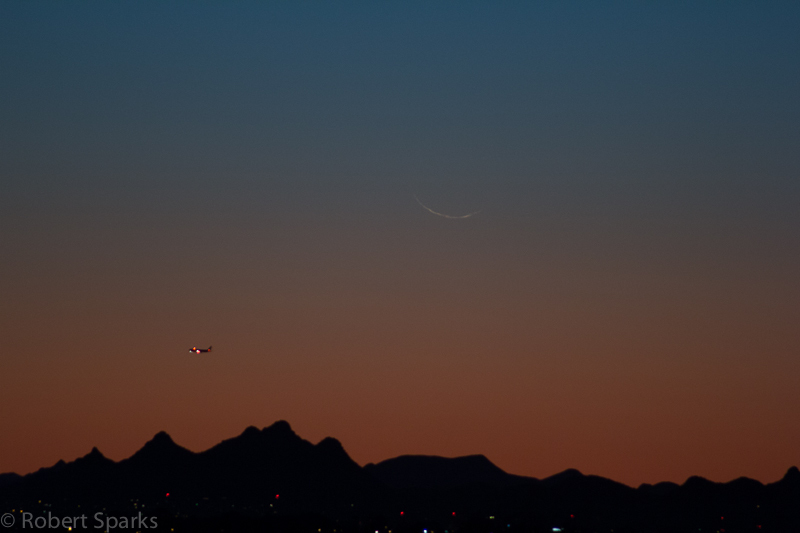 Here is a close up of the very young crescent Moon with a plane flying by. As I said, Mercury and Mars are still fairly close together so I turned my attention to them. 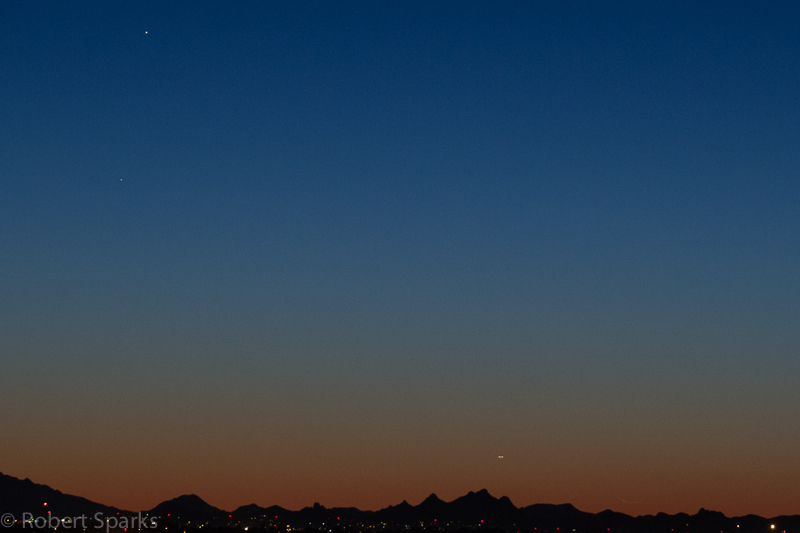 My real goal was to see if I could get Mercury, Mars and the crescent Moon. The Moon was rapidly setting at that time and I barely got it. Mercury is the brighter one toward the top and Mars is slightly beneath it. I got a plane in this one as well. The Moon is lower in the sky and its light is passing through more atmosphere so it doesn’t show up as well. 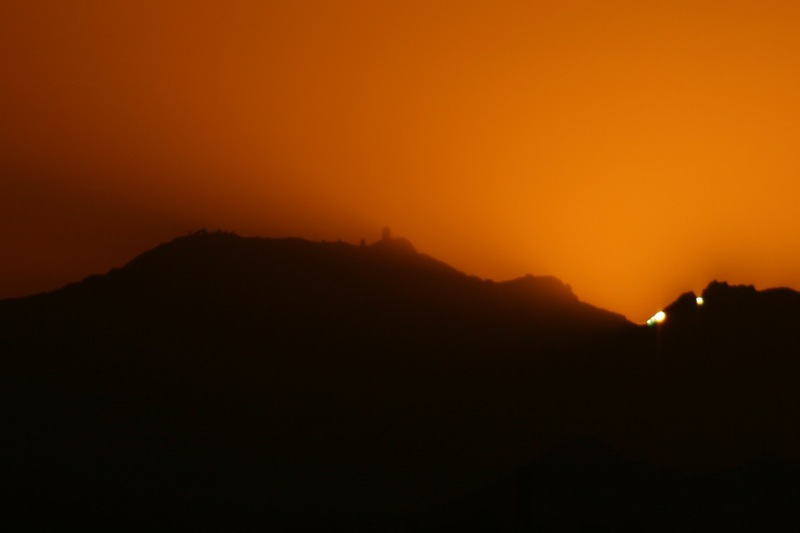 Look to the lower right of the bright plane, just above the horizon. You have to look very close. Tomorrow night the Moon will be much higher in the sky and easier to see. The Moon will be above and to the right of Mercury and about 3.8% illuminated, much easier to see. Mars will be the toughest of the three to pick out against the twilight sky, so have patience but don’t wait too long or they will set behind the western horizon before you see them! 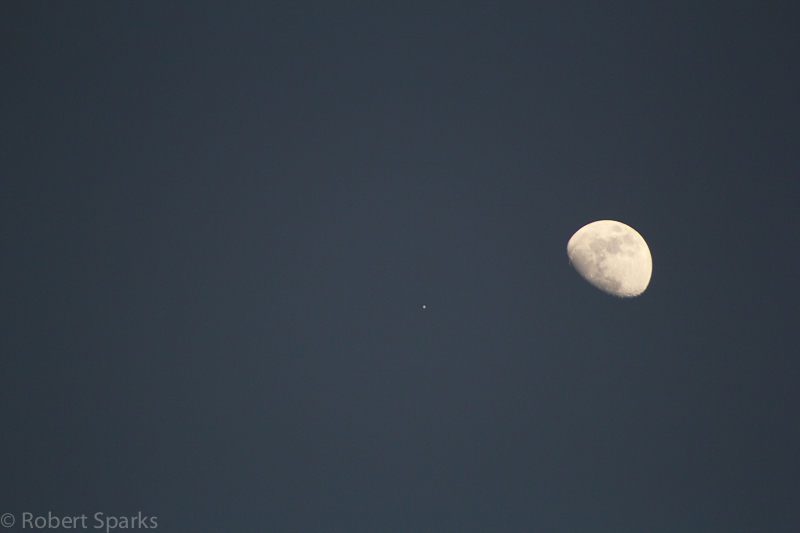 Okay, I blogged about the close pairing of the Moon and Jupiter so here are some photos. The first one I got about 3:00 in the afternoon, but I prefer this one I took about 3:30pm. Jupiter is to the lower left of the Moon. I went out for sunset as well. 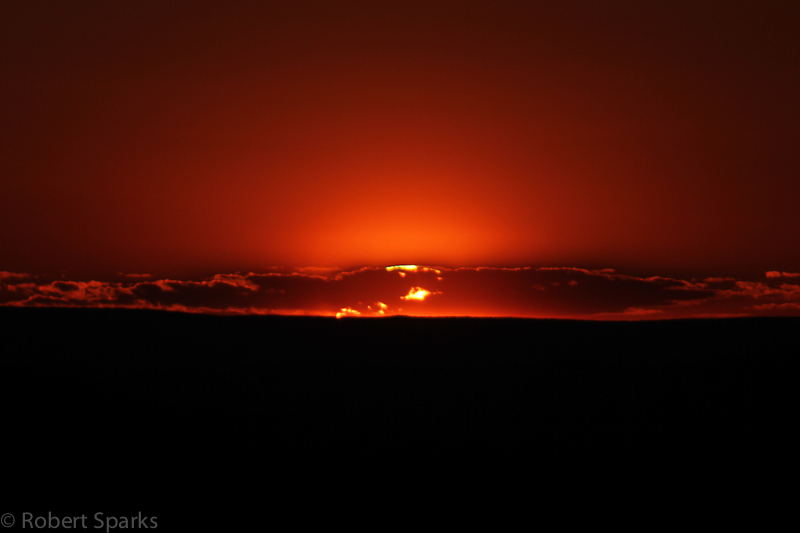 This is the first time I photographed sunset with my new Canon 60D. Wow! A bit different than my old camera! Shoots a lot faster and the sensitivity is different. 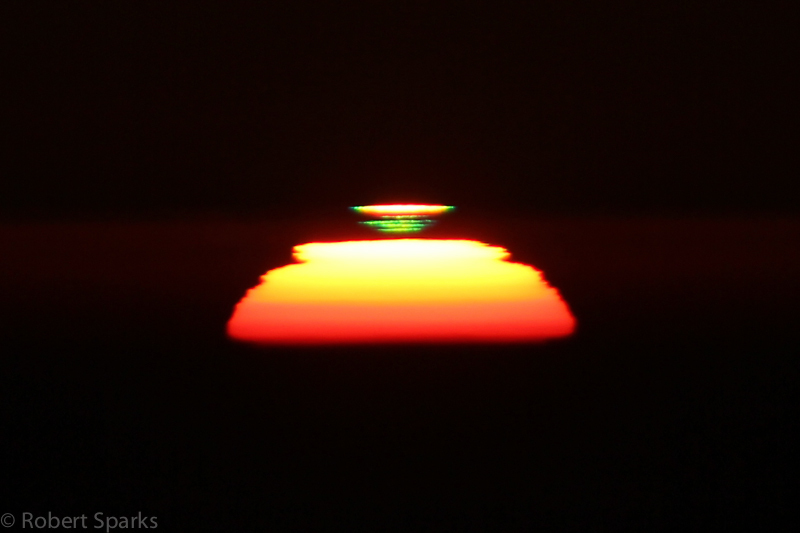 Managed to get the differences sorted out in time to get a green flash. I am sure I will get better as I practice with this camera. As soon as the Sun set, I turned to the Moon and Jupiter. About 8:00pm, I went back out and got this shot. The exposure was short to bring out details on the Moon. You can see the Montes Jura chain extending into the dark side of the Moon (upper left part of the Moon). 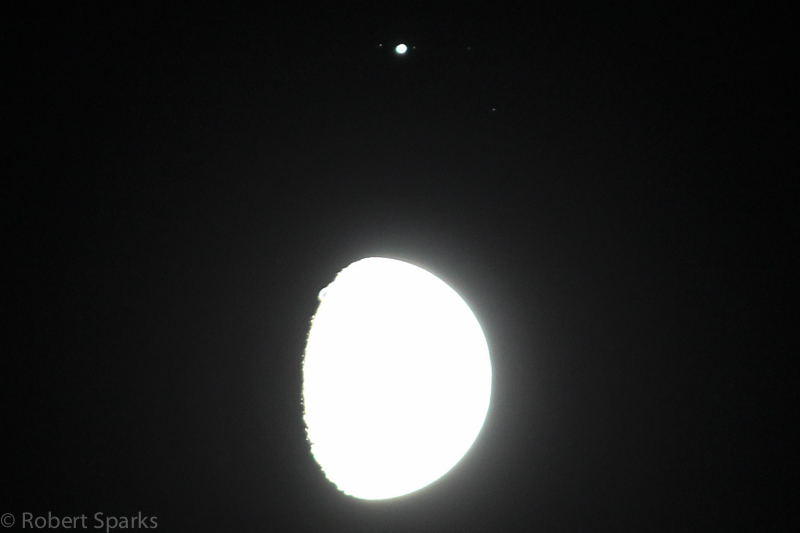 And I took one more with the Moon overexposed to bring out the Galilean Moons. Ganymede is to the left of Jupiter and Io and Callisto to the right. Europa was transiting in front of Jupiter at the time and not visible. I hope you got to see the conjunction. Another one will happen on February 18th, but it won’t be quite as close as this one. 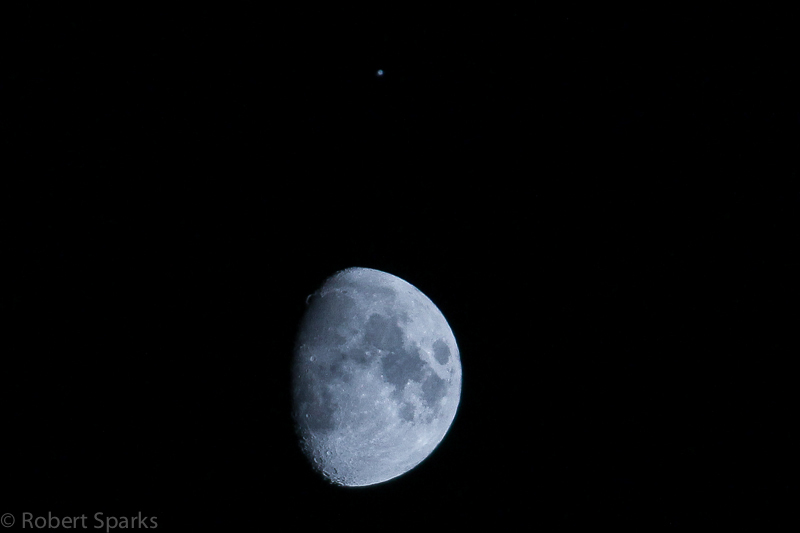 I blogged a couple of days ago about the Christmas Conjunction of Jupiter and the Moon. I even suggested today would be a good time to try for Jupiter during the day. 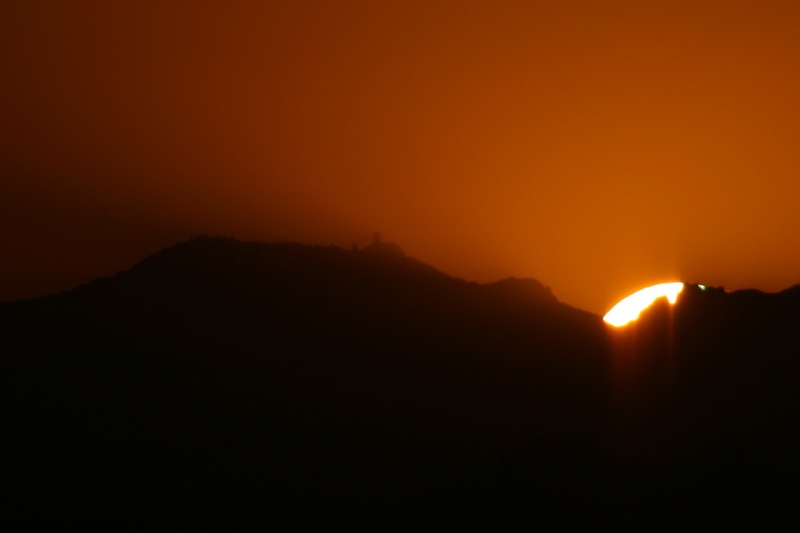 Unfortunately, in Tucson it was cloudy most of the day, especially later in the afternoon when the Moon and Jupiter would have been positioned for a daytime attempt. Early in the evening, the clouds were very thick and you could barely see where the Moon was in the sky behind the clouds with no sign of Jupiter. After watching the Doctor Who Christmas special, I went outside just to check and see if there was any chance of seeing anything. Much to my pleasant surprise, there were Jupiter and the Moon surrounded by a 22 degree Moon halo! Needless to say that necessitated grabbing a camera and a couple of my wider angle lenses (since the radius of the halo is 22 degrees, that means I need a a lens with at least a 44 degree field of view to see the whole thing…fortunately, I have a couple that will do the trick). So here are the pics. Very nice treat on Christmas night. Just goes to show you never know when the sky will give you a little break. I got a series of shots on December 2nd that I am finally getting around to posting. A great sunset series where you can watch the Sun turn from yellow to green to the much more rare blue flash as it sets. The blue flash is more rare than the green flash and I am always happy to get a good one. I still have never seen a blue flash naked eye, but this one shows up pretty well in the image! 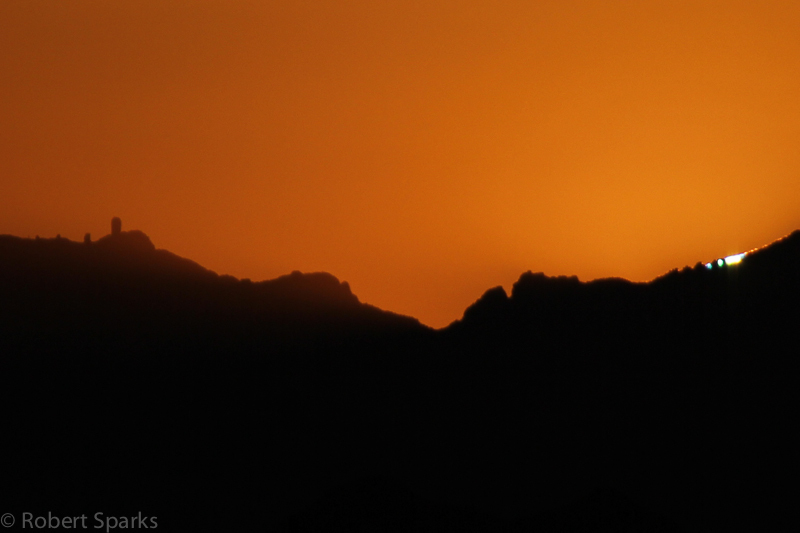 I took pictures on Saturday and Sunday night of the Sun setting behind Kitt Peak. Lots of little green flashes. Saturday night was particularly spectacular as the green flashes jumped out naked eye (I use a cable release to take the pics so I can watch sunset and photograph at the same time!). Here is a gallery of Saturday and Sunday night pics. Click any of them for a larger view. The last four are from Sunday night. Look for a couple of mock mirage flashes at the top of the Sun (the little piece that appears to have broken away from the Sun). 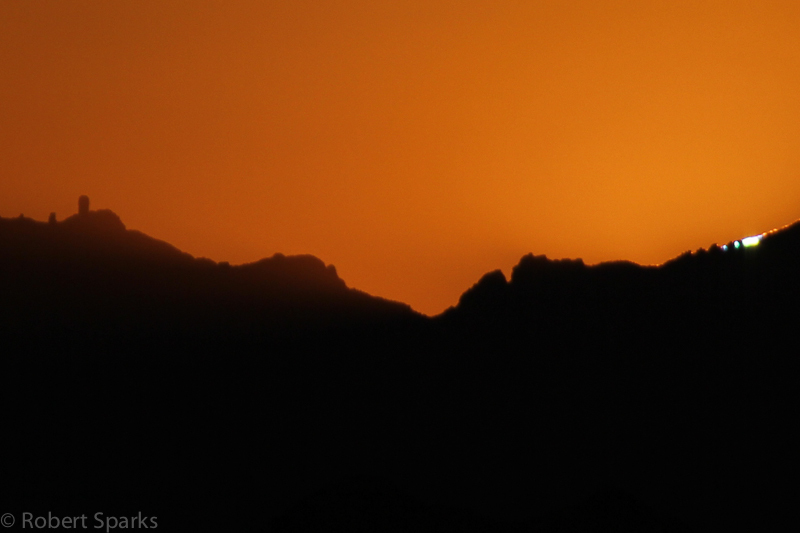 The Sun is setting south of Kitt Peak now and I really can’t get home from work in time to photograph sunset, so I am pretty much confined to weekend pics now until next spring. 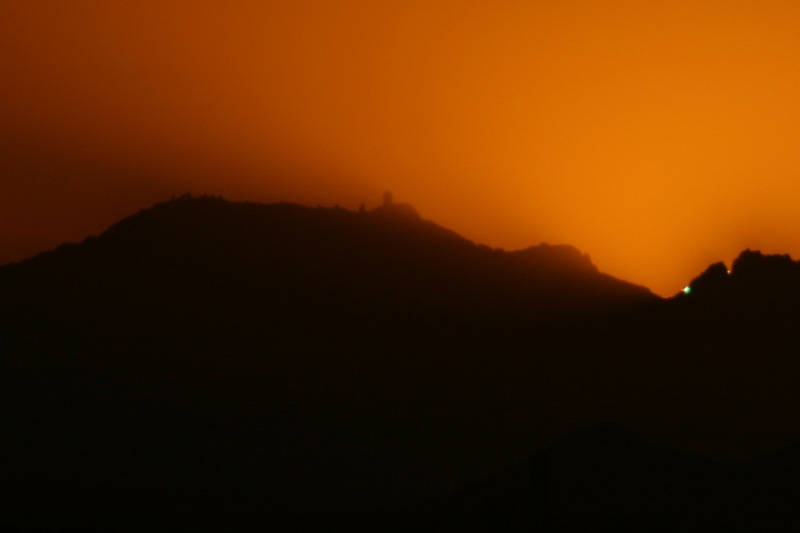 I am already looking forward to early February when the Sun will set behind Kitt Peak on its journey north. I haven’t posted in a while and am going to try and get back into it. I have been posting lots of pics on my twitter feed and google+ account, both of which are good places to keep track of my latest. 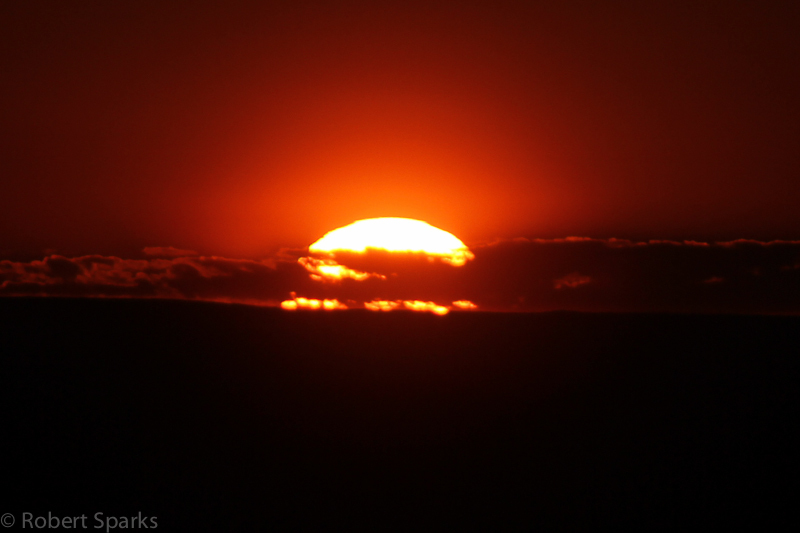 However, tonight’s Halloween sunset was particularly good. I wasn’t even sure I would get anything since there were lots of clouds. 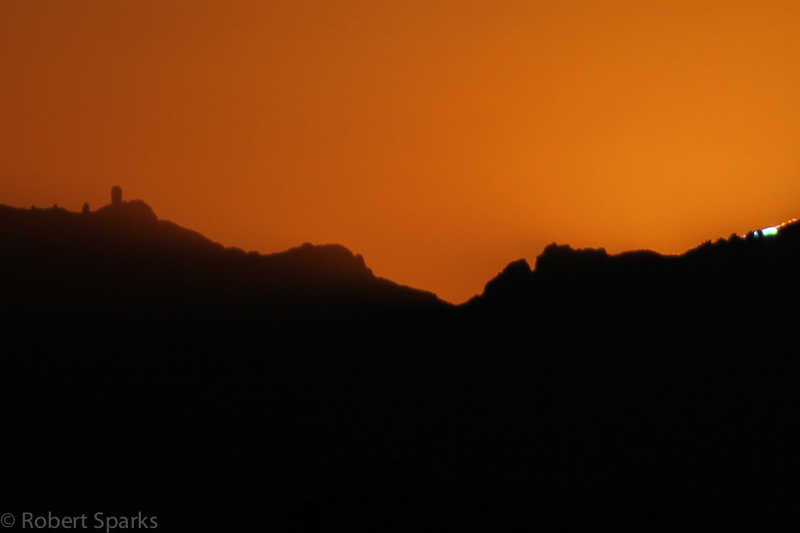 However, the Sun is setting just north of Kitt Peak and I wanted to get that shot (I really hope to get it RIGHT behind Kitt Peak in a few days!) 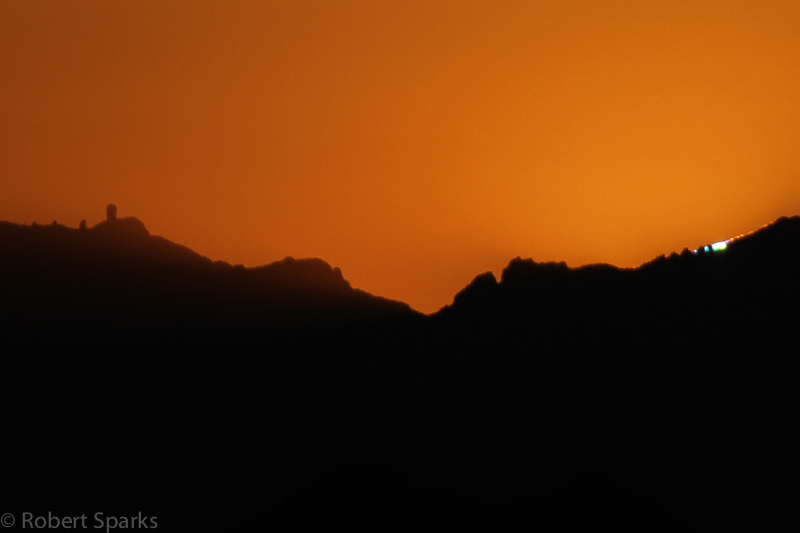 I was fortunate tonight and the sky was clear in the direction of Kitt Peak…at least clear near the horizon. Enjoy these shots…click to enlarge them. My name is Rob Sparks and I work at the National Optical Astronomy Observatory in Tucson in the Education and Public Outreach department. I am heavily involved in a variety of projects including the Galileoscope for the International Year of Astronomy. I am a former high school physics, math and astronomy teacher at The Good Hope School, St. Stephen’s Episcopal School, and the Priaire School. I went to Grinnell College for undergrad and got my MS at Michigan State. In my spare time, I do improv with Not Burnt Out, Just Unscrewed in Tucson. I have performed with the Redondo Music Theater as well. Other venues I have performed include the Apple Holler, Over Our Head Players, the Riverfront Theater, the Manatee Players, the Players of Sarasota, and the Island Players. I am a distance runner and do races up to the marathon distance. I keep in shape by doing a marathon each year and work out at Gold’s Gyms worldwide!